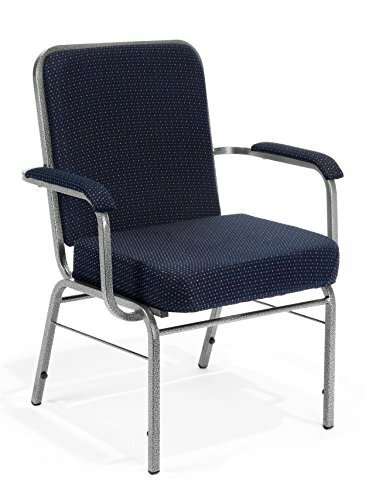 Everyone's comfortable in OFM's 300-XL Big and Tall Comfort Class Arm Chair. The 3" thick, high-density foam seat features an extra-wide waterfall seat design for extra comfort. Soft, padded arms add support and make sitting and standing easy. Choose from a variety of stylish, stain-resistant fabrics that will keep their good looks long term. The sturdy 16-gauge steel frame boasts a contemporary silver-vein finish to enhance your decor. Built-in ganging brackets add durability. Stacks 10 high and the optional dolly can hold up to 8 for easy storage. Weight capacity up to 500 lbs.